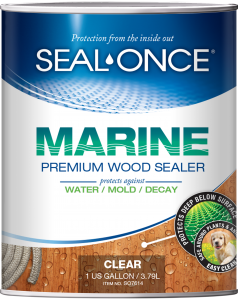 SEAL-ONCE® MARINE Premium Wood Sealer protects and stabilizes wood against water damage, salt water spray and decay. It uses proprietary nanotechnology to penetrate, coating the wood fibers at the cellular level. MARINE creates a long-lasting flexible breathable barrier that protects from the inside out. The clear formula allows the wood to age naturally without decay, morphing to a rich silver-gray over time, while adding our Semi-Transparent Tints provides additional UV protection, while enhancing the natural grain and texture. MARINE is completely eco-friendly, with ultra-low VOCs, and is safe to use around open water, marine life, pets, plants and people. All surfaces should be cleaned before sealing for best penetration and performance. Test absorbency after cleaning by sprinkling water on surface. If the water does not readily penetrate the surface, stripping will be necessary to remove old coatings. Do not use if air or surface temperature is below 45°F/7.22°C or above 95°F/35°C. Do not apply in rain or when rain is expected within 12-24 hours. DO NOT THIN. Mix well. Stir contents or shake thoroughly prior to use. Test a small area to ensure acceptable appearance and penetration. Apply first coat with a synthetic brush; pump-up garden sprayer; air-assisted; and/or airless sprayer. Use 15-17 tip and medium to coarse spray pattern. When spraying, always back brush for best results. Second coat can be applied once first coat has penetrated but is still damp. Second coat must be applied within one hour of applying first coat. For best results, apply in the shade and out of direct sunlight. When applying in direct sunlight and wood surface is hot, spray with a mist of water and apply SEAL-ONCE MARINE immediately on dampened surface. Apply to all surfaces. Apply SEAL ENDS ONCE® to wood ends. Do not use with other waterproofing products. Wood can be painted or stained as soon as it dries in approximately 2-3 hours, if SEAL-ONCE Semi-Transparent Tints are not being used. Allow approximately 2-3 hours for surface to dry, depending on temperature and humidity, before subjecting surface to light foot traffic. Allow 12-24 hours for full cure, depending on temperature and humidity. When recoating, apply as soon as previous coat has penetrated and surface is damp, not wet. Second coat must be applied within one hour of applying first coat. Clean application equipment with warm soapy water. Disposal: soap and water cleanup; no special disposal procedure needed. Store above 32°F/0°C to protect from freezing. Surfaces that have been treated with SEAL-ONCE MARINE Premium Wood Sealer can be cleaned using a mixture of 1-gallon warm water, 14 oz. bleach, and 1 oz. of Dawn® dish detergent. Apply this cleaning solution with a sprayer and allow to sit for 20 to 30 minutes on the wood surface before rinsing with water using a garden hose with a nozzle. This cleaning solution can be used to remove airborne mold and mildew stains, dirt and grime from the wood surface. SEAL-ONCE MARINE will prevent and resist any water, mold and mildew penetration. Do not use oxidizers, corrosives, or strippers on surfaces that have been treated with SEAL-ONCE MARINE. Surfaces can be recoated with SEAL-ONCE MARINE at any time. SEAL-ONCE MARINE may need to be reapplied for fading tint color, surface damage, in heavily worn or high traffic areas, or in places where the surface may have undergone noticeable changes. Before reapplying SEAL-ONCE MARINE, clean the surface using the recommended cleaning solution above. Apply SEAL-ONCE MARINE according to package instructions. When reapplying in small areas, lightly overlap onto areas previously treated with SEAL-ONCE MARINE. $5 Off your 1st Order. Sign Up to be a SEAL-ONCE insider and get early access to special offers & new products.